Mark died suddenly in the early hours of Sunday 9th January 2011 at the age of 42 of complications following treatment at Whiston Hospital. 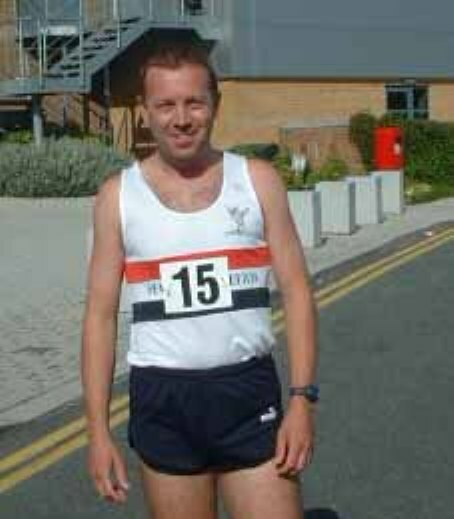 Mark was a key member of a very successful Pembroke track and field team specialising in 400m Hurdles and 800m running. After the merger Mark continued to turn out and support and was often seen at the Liverpool & District cross country fixtures frequently making the counters in the early part of century. He was a dependable team man always willing to make an effort to turn out and support the club whenever called upon. He will be sadly missed by all his many friends both inside and outside the club. I would just like to take this opportunity to thank everyone for their kind words and praise regarding Mark. Athletics was one of the great loves of his life and he never stopped running except when injury forced the issue. I was around in the ‘glory’ days of Liverpool Pembroke and I’ll never forget his pride when the club won a place in the British league. Repeated injury followed however, then the children, so competitive running took a back seat but he always loved the sport and always went for a run when he could even on holiday! Eventually he ventured into triathlons and had various successes with that but rejoined the athletics circuit by joining St.Helens Sutton AC two years ago as our son David was 8 and wanted to join. Recently our daughter Amy has joined too which made Mark so proud. Mark’s last race was a cross country at Woodbank Park in Stockport on 2nd Jan just one week before he died. I want to say thank you to everyone who attended his funeral and I’m sorry I didn’t get a chance to see you all. I heard of a few people who I haven’t seen for many years and I know Mark would be so touched as was I.
I can honestly say Mark was truly gent of a man with a kind caring natured soul. I first met Mark at a Northern league match for LPS in the summer of 2006. One thing that struck me was his constant happy supportive wellbeing. He literally had a smile on his face during the whole league match, even at the start line when the nerves start to kick in. I think this showed how much athletics meant to Mark. I remember he was put in for the 400m hurdles and 3000m steeplechase events. I was thinking is this guy crazy… but now come to think about it, he was just being a true team player!!!!! I was an instant fan. At the time I did not know much about Mark past athletic history, I think Rob Berry told me “See him (meaning Mark) he’s ran 1:50 for 800m.” I think my response was “NO WAY YOU ARE JOKING!” but yes it was true, he was a remarkable runner/athlete. So modest and humble!! His generosity and caring nature was demonstrated by giving me valuable training tips and advice for running a good 800m. I last saw Mark down at St Helens track in the summer of 2009. He was coaching his little boy, we had lots of chats about his son running and i remember his saying “He needs to concentrate more!” Making me chuckle. I also remember his constant shouts of encouragement of when i was training around the track. The guy was not just a great athlete but a beautiful soul! I will never forget you mate, thanks for everything. My thoughts go out to his family and close friends. I remember Mark from the days when we used to train at Kirkby in the late 80’s and although I never trained with him directly I was impressed with his tenacity and attention to his training. I would like to pass my condolences onto his family and his friends. I have only just read about Mark and it is fair to say I am absolutely shell shocked. Mark was one of the kindest and nicest people I had the pleasure to train with over the years and I am only sorry I did not get the opportunity to pay my respects. I first met Mark down at the old Kirby Stadium and even now can still picture the smile that seemed to spread across his face at any given opportunity. I can’t remember him once joining in the banter and micky taking that went on in the group, he just seemed to never have a bad word to say about anyone, but I guess that is what made him the person he was. I did bump in to Mark a few times after that at various athletics track and we did compare family notes and talked about life generally, he always seemed just so happy about everything. Mark was without doubt one of the nicest people I have had the fortune to spend time with and my thoughts really go out to his family. Mark, as an athlete, is one of those who I can’t exactly remember the first day he was introduced into the sprint group I was training with those years ago. (Jamo, Freemo Garland etc.) For he is one of those people who stepped into my world so quietly and almost, fair to say, slipped away without too much noise either but leaves me with a huge impression. Athletically, he tip toed with such stealth over many track surfaces over many seasons warm and cool punctuating his Pembroke career with so many memorable team performances. His presence and contribution to our club I feel eternally great full for…A Massive quiet presence. Utterly dependable and a true gentlemen thank you Mark from my heart. That he possessed some real athletic talent is true but this said, I believe, what underpinned and assured us of his qualities I and so many others benefited from and for so long was that he was part of a truly great team…his family. Meeting his family again all-together this time for a sadder occasion made it all the more obvious. The family team headed by his wonderful mother Vera and partnered by another great lady, beautiful pretty Debbie his wife. He has won the greatest race of all, a successful, positive life. He has two wonderful children David and Amy. I would not be surprised to hear of them enjoying and passing on further happiness’s. David and Amy you are beautiful and wonderful and an absolute credit to your great father Mark and super mother Debbie. Thanks to you Mrs Barrow(s)…both of you. Mark was a wonderful person “the best”, and I was privileged to have him as my best mate throughout his life, I know he would be humbled by the tributes being paid here and so very grateful for all the kind words and thoughts for his family; so I would like to thank everyone on his and their behalf. Thank you to all those who were able to attend St Ann’s church; Widnes Crematorium and/or the Rainhill ex-serviceman’s club to pay their respects yesterday, I have never seen such an overwhelming turn out and it meant a lot to Marks family. Mark was born in Rainhill, went to school here, grew up, and met Debbie “the love of his life”, he got married at this church, and had two beautiful children; David and Amy who were both christened here, his life was always filled with fun and excitement and he was very popular with everyone who knew him, he was a Rainhill lad through and through. Debbie and Mark met on Christmas eve at the Vic pub, he fell head over heels for Debbie immediately and invited her to join the family on their annual trip to the IOM just three months later, their relationship blossomed into marriage and the most wonderful kids anyone could ask for followed, David and Amy are a credit to Mark and Debbie. Going to the Isle of Man on the boat, Mark was looking after Debbie, David and Amy who were all suffering sea sickness but they weren’t the only ones so Mark was straight onto it and supplied and collected sick bags for anyone he could help. That was typical of Marks caring attitude. Mark was always keen to support the kids and was never one to shy away from parental responsibilities, He found out about a school trip which needed volunteers to help supervise the children so he signed up and excitedly told Debbie he was going to “Cadbury World” on a School trip. Mark always had Mars bar in his pocket and would eat one after his tea so this was the perfect school trip for him. I remember speaking with him after the trip, were it had turned out that he’d become the centre of the kid’s attention all day and on the coach where he sat with them at the back, he was loved by all and he described the trip afterwards as being FANTASTIC. Mark started work at Heartwood; I think we all have a piece of Pine furniture in our possession as a result of his generosity, He was always ambitious and took the initiative to start his own business teaching people to drive; he started with BSM and decided to buy himself a brief case, this didn’t last long though; he moved to the AA then started his own driving school which he successfully ran for the past Five years. I have been calling his pupils this week and can tell you they all spoke very highly of him. Mark Did see a fair chunk of the world with Debbie before they had the kids but he preferred the simple holidays like those we had in our Caravans, Marks caravan had been specially adapted using various pieces of MDF to fashion tables, safety devices, bin holders, you name it… He was a gadget man from Bug zappers to levelling devices; you name it, he had them all. Mark recently went to California with the family and had a great time but his favourite place in the whole world was Port Sodrick in the Isle of Man, the IOM held a special place in Marks heart for a number of reasons and its simple way matched his own modest needs better than anywhere else. A modesty that was reflected in everything he did, forget your Steaks, Salmon or caviar; Marks favourite meal was mash and beans with lashings of tomato sauce. Mark was the life and soul of any party, we have placed some photos on the walls in the ex serviceman’s club to portray the effort that he always made in his inventive fancy dress ideas, he was usually unrecognisable and was always entertaining. Marks mind was always ticking over and his projects were meticulously planned and executed each time, but no sooner had one project finished than his next would start with the Pen and Paper out; Debbie would always be apprehensive asking “what are you up to now”? but Mark would never tell until all the I’s were dotted and T’s crossed; so I remember Debbie coming home from work one day to find Mark and I with sledge hammer and saw having taken the Kitchen wall down to make a Kitchen/ Diner. Other projects included Patio doors, Decking and a loft conversion and I can let the Cat out the bag now and tell you his Garage was about to become a games room/Gym in the near future. Mark joined Liverpool Pembroke and Sefton Athletics Club and they have a fitting tribute to him on their website which I would recommend you take a look at as they sum him up as person up very well. He was very understated and modest, so it may surprise some of you to hear that since going on to compete in the seniors triathlon event; he recently came 4th in the British Modern Triathlon Championships 2010. The team secured 1st place overall thanks to Marks contribution and knew him as “The Rainhill Rocket”. Mark was respected by all his neighbours so I was not surprised to hear that they will miss him and don’t believe they will ever find another neighbour like him, He would jump over the fence to help at the sight of a paint brush. Is there anything this man didn’t do? Mark first embarked on his Life saving exploits during his honeymoon with Debbie in Turkey, he hired a speedboat and found a Turkish man in trouble in the sea miles away from shore, so mark rescued him and he and Debbie were guests of honour at the man’s bar as an expression of gratitude. More recently a child had got out of his depth at the local swimming baths, with no Lifeguard in site a fully clothed Mark had vaulted the spectator railing and was straight in the pool fully clothed to pull the boy to safety, this ruined Marks mobile phone “but he needed a new one anyway” so that was just that. So sad to hear about Mark passing away at 42. I went to school with Mark and also ran with him at Sutton St.Helens, he was always a kind and gentle fellow and had the time for anyone. I will always remember his smile and charm. My thoughts are with the family at this sad time. Rip Mark. I had never really spoken to Mark until I had a brief period as Club captain for Road and Cross Country in 2001-2. I had trained a few times at Kirkby with him in the 90s but we had never really spoken. I used to dread going up there for those tough sessions but he always seemed to have a smile on his face and just got on with it. Getting a team together for the relays was not always easy at that time but he was always one you could rely on to turn out and do his best whatever his state of fitness. He once helped me out at VERY late notice when we were struggling to get a 12 stage team together. Such was his dedication to the club. I know Mark was an excellent 800m runner but he was a determined character on all surfaces. I distinctly remember hanging onto him desperately through the mud at Arrowe Park once convincing myself that, as a track runner, he would soon fade away. He didn’t and simply kicked away from me with ease at the end. When we did speak he was always open, friendly and encouraging. A tragic loss at such a young age. Deepest sympathy to his family. Mark was a very gifted athlete, he was someone who I had the honour of training with at Kirkby stadium for many years. Mark was organised towards his running, he had a determination to get the most out of his talent, his ability in every distance was widespread. Mark was genuine, easy going person who I had the pleasure of knowing since I first raced him at Pilkingtons in 1989. My sympathies go to his wife, children and family. I shared some of my strongest heartbeats with Mark Barrow. Mark was a great training partner and opponent. I first met Mark at the Lancashire Athletic Association Championships. We became friends almost immediately. What struck me straight away about Mark was his tenacity. He would want to know how everybody was running over 800 meters in the North. He would then focus and try to match them and damn well beat them. I could only hold on to him for that season. We both improved and trained together. I would knock a 10th off my 800 PB, he would match it. I it’s hard to have a mate who is your Nemesis and even harder when he tells you were you went wrong, in such a pleasant manner. The season that is the most memorable is the last Lancashire AAC held at the old Robin Park Stadium. We both won a place in the final of the 800. A memorable race for a good reason, Mark won his first senior medal, coming second to Ian Grime. This is something we had talked about the previous season, he went and done it. Mark had a determination to do as well as he could, to be the best that he could be. Mark was a believer, he believed in himself. My deepest condolences to Mark’s family and friends Rest in peace mate. Many of those who have already paid their tributes – remember Mark as I do as an exceptional individual and a great athlete. Many of those who have already paid their tributes will have trained hard alongside Mark particularly on Tuesday and Thursday nights at Kirkby – Mark was a fundamental element of what was a superb training squad – we all had many successes. I remember the times spent with Mark – travelling to and from races – warming up or down – and giving support to other members of the team. I remember Mark enjoying his running immensely always with a smile on his face. And I will always remember Mark running with his head held high – whatever the distance and whatever the weather. It was with disbelief and great sadness that I heard of Mark’s passing. I remember him as a thoroughly decent, kind and friendly guy and a wonderful club man. Mark will forever be associated in my mind with that happy era when his talent, versatility and sheer determination helped LPS to punch above it’s weight and achieve a long cherished ambition of British League status. We have truly lost one of life’s good guys. My thoughts are with Mark’s wife and family. I was saddened to hear of Marks’s passing and although not a close friend we would often chat when warming up and down at Kirkby after track sessions or occasionally when we met at cross country races. I will remember Mark as a very friendly, warm and approachable person who possessed incredible speed and was an excellent athlete across a range of different surfaces and distances. Mark Barrow, the guy who always smiled. Mark Barrow, the guy who always turned up for training come rain or shine. Mark Barrow the guy who wouldn’t stop sitting on my shoulder when sprinting down the home straight at Kirkby. I have a lasting memory of Mark doing the latter wearing a Pilks vest in the late 80’s during an 800m race probably at a Northern League/GRE Cup Match at Kirkby. It was a slow race with the usual last 200m burn-up, very much common at those events. I had the race won but then the quick glance right, guess who was there, quiet as a mouse and try, try, try as I could he just wouldn’t go away. By god that race hurt. Mark soon became a loyal LPS member and then began a friendship that was once a rivalry. As many have said Mark Barrow was such a great fella to train with and be around, a true gentleman, and an athletics legend. My thoughts go out to his wife and family. I was so sad to hear of Mark Barrow’s passing and would like to say a few words about Mark. I first met Mark in the late 80’s when I trained with Steve Freeman at Kirkby. Mark was always a gentleman and always had time to say hello. This continued over the next 20 years when we crossed paths at different meetings. It was never an effort for Mark to take the time to say hello. I remember at a recent meeting when Mark wasn’t as fit as he had been I had great pleasure in telling the younger athletes at our club what a great athlete he was and had been. He will be greatly missed. My thoughts are with Marks wife and family. From the moment Mark joined Liverpool Pembroke and later LPS he became one of its most loyal and hard working members. He joined an outstanding group of what became the club’s best ever track and field team culminating in that famous day at Watford, mentioned elsewhere.. While his best distance was 800m he was willing to turn his considerable talent to an array of other events if the occasion demanded. He was indispensable to the club. He was immeasurably respected and it was a huge privilege to have been associated with him. I first met Mark as a 13 year old training under Alan and Zoe Prescott. I considered Mark a fantastic training partner who sacrificed so much to make me a better athlete. It is a massive compliment to Mark that he pushed me so hard in my over distance work that I become the youngest person ever to run for Great Britain at a senior world championship. Mark was without doubt one of the good guys, always with a smile on his face and I never heard him say a bad word about anyone. My thoughts are with Marks family. We have lost a really nice guy. Mark was a decent, dependable and very likeable lad. If he hadn’t been such a team player he might have made more of a name for himself in athletics as there was no doubt he had talent. It’s 20 years since I’ve seen him but it’s still a blow as we had such a great team spirit in those days. Wherever you are I hope there’s a track. I went to college with Mark doing Wood Machining for 2 years in the 1987/88..We talked about our love for athletics and I got him to join Liverpool Pembroke. He came to Kirkby with me and trained with our group. It was obvious that he was way too fast and talented to carry on with us ,so John Bradshaw took him to his group. I was fortunate enough to know Mark through training with him for one winter in the early nineties at Kirkby stadium a couple of times a week under Alan Prescott, so I have first hand experience of just how good an athlete Mark was, let me tell you, this lad could shift! back then I remember him being called sparrow barrow due to his slight frame, so I was just a little surprised to see him out jumping just about everybody in the high jump in a league match at Preston. Mark joined my club St Helens Sutton to help his kids get involved with athletics, though he was very loyal to Pembroke, about a year before he joined St Helens I remember him saying to me that he would not compete for any other club, despite me trying to change his mind, so I think it was probably only his kids that could get him to join us. The last time I saw Mark was when he was running in a cross country race at Sherdley Park St Helens 21 December 2010 I remember him telling me (in that proud parent way) that he had arrived early to watch his kids compete in the junior races. One of Mark’s qualities was his modesty, not a lot of people in his training group knew just how good Mark was, despite him not being in his best shape, you would never hear him saying I have ran this time or ran that fast. He was starting to get back into some kind of shape having done some training and competing in a couple of races, his last race was to be a cross country race at Stockport on the 2January this year. You will not meet a nicer person than Mark Barrow and I feel very privileged to have known him, bye sparrow. I first met Mark and his family when I competed alongside him for Pilkington Harriers as a senior. I later had the pleasure and privilege of coaching Mark in the mid-late 90’s when he was part of my hugely talented group of sub-50 sec 400m runners which included international athlete Guy Bullock. Mark was a very talented athlete and could more than hold his own with his training partners. Such was the talent within that group that most training sessions were highly competitive but Mark’s work ethic was second to none and he would always be the one setting a punishing pace on the endurance sessions. Mark was one of the most likeable people I have ever known and it was a huge shock to learn of his death. My thoughts are with his family. As an ex-Pilkington Harrier I have known Mark since he was just a young boy and I was a teenager and he followed in the footsteps of his sisters by joining the club. When Mark was older my husband competed alongside him and later coached him. When Mark became driving instructor he also taught my son to drive. I have read other people’s comments about the number of events that Mark used to cover at league meetings for LPS. He developed this ‘mad streak’ while competing for Pilkington Harriers senior men’s team. I was present at many a Northern League match where Mark was one of about half a dozen Pilks athletes (two of the others being my husband, Alan and my brother, Neil) who, between them, covered most of the events on the timetable. It was all done in high spirits and secretly I think it became a competition between them to see who could cover the most events. Mark was a talented athlete and covered all his events to the max. There was no jogging round for a point or just taking one jump – he was far too competitive for that, but in the nicest possible way. Above all else, Mark always had a smile on his face and was just a really nice guy – so much so that even though our paths hadn’t crossed for a while the news of his untimely and tragic death brought tears to my eyes. I hope that his family will take some comfort from the fact that Mark’s warm and gentle personality touched more people than they could possibly know. Rest in peace Mark, you were a true gentleman. Sometimes some things just don’t make sense. After the highs of Christmas and New Year we were quickly brought back down to earth on hearing of the shock departure of someone so young. Barrow was a member of Pembroke and Pembroke Sefton for many years, and when he put that vest on you knew he would be giving everything he could, whether that be at the Long or High Jumps, Hurdles, relays, Sprints 800 Meters or over the cross country. Never one to moan about doing so many different events at one meeting he would just get on with what he was asked to do. 100% certain that if he could do 3-4 legs of the 12 stage he would do so. I trained with Barrow on many occasions at Kirkby, back in the day, and I was only speaking with his wife Debbie today at how I cold never seem to wind him up or get him to swear at me. His dedication and determination to training and competing were second to none, and watching him grace the Orange rubber where we spent most of our Tuesdays and Thursdays being encouraged by Mr Brad was a privilege. Not shy of the cross country, Barrow would always be up there doing what he did best. Barrow was also a driving instructor who took many of us on driving lessons, enabling us to pass our driving tests. Even at this he was so patient giving us encouragement when we only thought of failure. One of the nicest and friendliest men I have ever met. I have very fond memories of my time at the club, and Mark was a big part of that. We often were two parts of the 400m / 4x400m / 4x100m, so I was lucky to get lots of smiles and words of encouragement from him, from across the track. He was a fast runner, but even if he had been slow, it still would have been an privilege and a joy to have him in the team. I feel so proud thinking back to that day in Watford – one of the greatest days in my life – a day that will always be connected with Mark. I’m not going to comment on Mark’s sporting achievements – there are many far better qualified than me to do so. But I would like to pay tribute to him as a person. He had a wonderfully warm personality and more than anyone made a real effort to make me feel welcome in the club in the days when Dave and I lived down south. He would see me no more than 3 or 4 times a year but always took time to come and have a chat with me and to involve me in conversations with others who I didn’t know well. I can’t recall ever seeing him with anything other than a smile on his face despite his strong competitive streak – he was gracious in both success and defeat. He was always a true gentleman and will be missed by everyone who had the pleasure of knowing him. My sincere condolences go to his family at this difficult time. What a terrible shock it was to hear about Mark passing away. Mark Barrow was the type of person every athletics team manager wants come Saturday afternoon. He was talented, determined, reliable and team orientated. He enjoyed the banter with his team mates and despite people thinking of him as quiet and unassuming, Mark could give as good as he got and always had a wry smile on his face. Mark’s ability even stretched to 10k road running and he ran some very creditable times in the late 90’s/early 2000’s. My memories of Mark are very happy ones, he was the sort of person you were glad you had met along the way. Mark excelled in athletics but more importantly he excelled as a great person and family man. My thoughts and condolences are with Mark’s family and friends. Mark was a prodigious point scorer for the club in track and field matches ranging from hurdles, sprints, middle distance and relays, even high jumping. He would also turn out in longer races and latterly he was enjoying triathlons. He was a quiet almost self effacing man, instantly likeable. He made a lot of friends in the sport. He belonged to that class of athlete that would be termed `Corinthian’ a great lover of competition but generous in victory and defeat. A thoroughly decent man he will be greatly missed and our thoughts go out to his wife Debbie and his family. Mark Barrow was one of nature’s true gentleman. He was someone about whom never a bad word was spoken or heard. He had a disarming smile which radiated calm wherever he went. His personal modesty was combined with an athleticism which enabled him to produce many fine performances for his club. When his son expressed an interest in athletics Mark brought him down to St Helens-Sutton and provided us with an insight into the quality of his own training which underpinned his career success. It was a privilege to have known him and his sudden passing has saddened everyone who had the pleasure of meeting him. The loss which LPS feels so deeply is echoed at St Helens-Sutton. Mark was one of those people of whom it can be truly said – he will be missed. Our thoughts and prayers are with his widow, Debbie, their two children and the extended Barrow family. It is with great sadness and shock I hear of mark’s untimely death. Mark joined Pembroke relatively soon after I did so and we team mates in many events for Pembroke afterwards. This includes that wonderful day at Watford when we were promoted to the British league; indeed he may even have lent me some his natural pace down the finishing straight of the 5k that day! When mark was in the team you always knew you would get a good performance from him and many valuable points, he was our main 800m runner for many years but turned his hand to many events when needed, without compliant. I distinctly remember some very good high jumps from him! His modest nature did hide an inner strong determination and a fierce competitor, you knew he would always give his best and proved it many a time, even muddy x-country races that were not his natural domain. However what I will really remember was he was such a nice person and always good to catch up with and have friendly chat. Even after I left Liverpool and would bump into him at some athletic event or other he would always take to time to see how you were doing and catch up. I feel great shock at this news and so can hardly imagine how his family feels, my thoughts are with them. It is with great sadness I find myself penning a few words about the untimely passing of Mark Barrow. After joining the club in 1989 he excelled over the 400m, 800m, 1500m and long hurdles, his last appearance in 2008 being over the steeplechase. Those 20 years of loyal service spanned the most successful era in the clubs’ history, our spell in the British Athletics League. Indeed Mark was one of our winners at the promotion match which put us in that elevated company. Always easygoing his light and cheery manner camouflaged a steely determination. A combination of talent and hard graft formed the hallmark on an impressive string of outstanding performances throughout his athletic career. Our thoughts are with his wife and children and we pray time blunts the painful edge of recent events, leaving them only happy memories and pride in a life characterised by high achievement. Mark was a great chap who you could always depend on to wins points for you in the 400m hurdles, 800m or relay at both Northern and National league level. He was a member of the team which won us national league status at Watford in the late 1990s. A versatile runner who could also lend his hand over the longer distance and turned out for the club in cross country and road relays. He began his athletics career with Pilkington harriers before joining Pembroke in the late 1980s, he recently joined St Helens Sutton as his son was training with them but still kept in contact with his many friend in LPS, Our thoughts are with his family at this very sad time.